Presbyopia is an eye condition that causes near objects to be blurry. Presbyopia typically begins to affect patients in their early 40’s. Although some patients develop it later than others, presbyopia affects everyone eventually. This is the reason why most patients in this age group need reading glasses or bifocals. The crystalline lens of the eye changes shape to adjust the focus of the eye between distant and near objects. Over time, the lens loses its elasticity and can no longer adjust its shape when viewing near objects. This is a natural aging process. Many patients first notice requiring more light to view close objects. This is usually followed by the need to push reading material out further. Unfortunately, your arms eventually will not be long enough to compensate for presbyopia and near objects will be blurry under all conditions. Symptoms can also include eye strain and headaches. For patients who currently wear glasses for the distance, there are a few options. 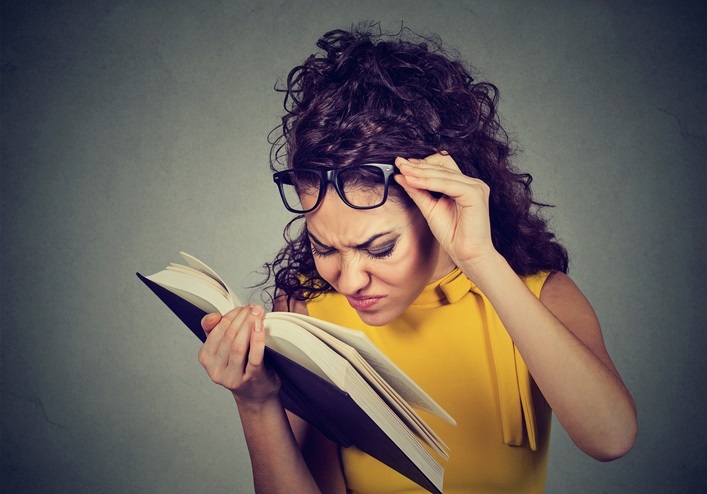 Patients who are nearsighted can often take their distance glasses off to read. When this isn’t an option, separate pairs of glasses, bifocals or progressive lenses may be recommended. Farsighted patients can also benefit from a separate pair of reading glasses, bifocals or progressives. Multifocal or monovision contact lenses may also be an option. Wearing reading glasses over contact lenses is another option. For patients who have never worn glasses before and have perfect distance vision without any correction, over the counter readers can be a viable and relatively cheap option to treat presbyopia. However, this isn’t a substitute for routine eye care. Everyone should have routine, annual eye exams to rule out silent eye diseases which, if undetected, could be vision-threatening. Can presbyopia be treated with LASIK or PRK laser vision correction? Yes, there is a LASIK and PRK eye surgery which can be an effective way to treat presbyopia. For presbyopia, the LASIK and PRK procedures are modified so that one eye is optimized for distance vision and the other for near vision tasks. Click here to read more about monovision laser vision correction. Of course, you’ll need an evaluation to determine whether or not you’re a candidate for either surgery. Click here to schedule a free LASIK or PRK consultation. This entry was posted in Blog and tagged Presbyopia. Bookmark the permalink.